The Truth; the Whole Truth and Nothing but the Truth. That Truth that is needed to save Mankind. Why is eating Pork forbidden by our Creator? NEITHER JESUS CHRIST NOR PROPHET MUHAMMED ATE PORK. In fact none of the prophets listed in the Bible and the Qur’an ate pork. Why the meat of the pig, or swine or hog for food has been forbidden in both Judaism and Al-Islam? 1) A pig is a real garbage gut. It will eat anything including urine, excrement, dirt, decaying animal flesh, maggots, or decaying vegetables. They will even eat the cancerous growths off other pigs or animals. 2) The meat and fat of a pig absorbs toxins like a sponge. Their meat can be 30 times more toxic than …beef or venison. 3) When eating beef or venison, it takes 8 to 9 hours to digest the meat so what little toxins are in the meat are slowly put into our system and can be filtered by the liver. But when pork is eaten, it takes only 4 hours to digest the meat. We thus get a much higher level of toxins within a shorter time. 4) Unlike other mammals, a pig does not sweat or perspire. Perspiration is a means by which toxins are removed from the body. Since a pig does not sweat, the toxins remain within its body and in the meat. 5) Pigs and swine are so poisonous that you can hardly kill them with strychnine or other poisons. 6) Farmers will often pen up pigs within a rattlesnake nest because the pigs will eat the snakes, and if bitten they will not be harmed by the venom. 7) When a pig is butchered, worms and insects take to its flesh sooner and faster than to other animal’s flesh. In a few days the swine flesh is full of worms. Swine and pigs have over a dozen parasites within them, such as tapeworms, flukes, worms, and trichinae. There is no safe temperature at which pork can be cooked to ensure that all these parasites, their cysts, and eggs will be killed. 9) Pig meat has twice as much fat as beef. A 3 oz T bone steak contains 8.5 grams of fat; a 3 oz pork chop contains 18 grams of fat. A 3 oz beef rib has 11.1 grams of fat; a 3 oz pork spare rib has 23.2 grams of fat. 10) Cows have a complex digestive system, having four stomachs. It thus takes over 24 hours to digest their vegetarian diet causing its food to be purified of toxins. In contrast, the swine’s one stomach takes only about 4 hours to digest its foul diet, turning its toxic food into flesh. 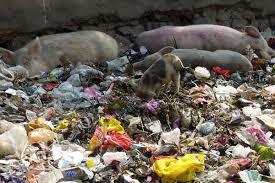 11) The swine carries about 30 diseases which can be easily passed to humans. This is why God commanded that we are not even to touch their carcase (Leviticus 11:8). 12) The trichinae worm of the swine is microscopically small, and once ingested can lodge itself in our intestines, muscles, spinal cord or the brain. This results in the disease trichinosis. The symptoms are sometimes lacking, but when present they are mistaken for other diseases, such as typhoid, arthritis, rheumatism, gastritis, MS, meningitis, gall bladder trouble, or acute alcoholism. One of the biggest concerns with eating pork meat is trichinellosis or trichinosis. This is an infection that humans get from eating undercooked or uncooked pork that contains the larvae of the trichinella worm. This worm parasite is very commonly found in pork. When the worm, most often living in cysts in the stomach, opens through stomach acids, its larvae are released into the body of the pig). 13) The pig is so poisonous and filthy, that nature had to prepare him a sewer line or canal running down each leg with an outlet in the bottom of the foot. Out of this hole oozes pus and filth his body cannot pass into its system fast enough. Some of this pus gets into the meat of the pig. 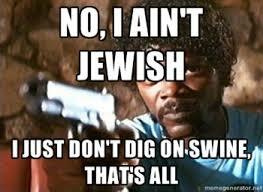 14) According to Jewish law, pork is one of a number of foods forbidden from consumption by Jews. These foods are known as “non-kosher” foods. In order for a meat to be kosher, it must first come from a kosher animal. A kosher animal must be a ruminant and have split hooves – therefore cows, sheep, goats and deer are all kosher, whereas camels and pigs (having each only one sign of kashrut) are not kosher. 15) Quran, Holy book of Muslims also prohibits consumption of pork. Of course our Creator has given us the health laws through the Holy Qur’an and not eating pigs is even CLEARLY mentioned in the Bible (Leviticus 11:07). Pigs were not in the so-called “New World,” later called the Americas; until they were brought here by the people from Europe. 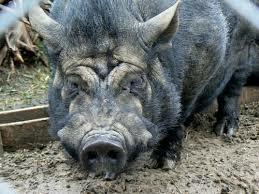 All the wild pigs, we now see in the Americas; are descendants of the domestic pigs brought from Europe. 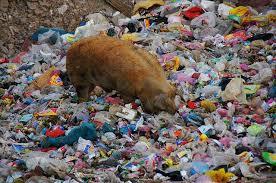 Pigs are scavengers just like crows and buzzards. They eat anything dead. The majority of Native Americans in the USA, never ate pork until, it was fed to them while they were confined to the “Indian Reservation/Concentration camps”. Their movement was restricted and they were prevented from hunting and fishing for the food that their ancestors used to eat. During the times of American slavery; the slaves’ daily food was so bad that they looked forward to the times when they were given pork to eat. Their hunger was so great that they ate every part of the pig, including the intestines (now called chitlins), which were saturated with feces. The very first thing that Malcolm X did on his path of self-awareness, was to stop eating pork (read The Autobiography of Malcolm X). Many people of African descent claim to love Malcolm X; but they continue to eat pork. Their love for Malcolm X, is hypocritical. Besides the physical reasons why Human Beings should not eat pork; there is also a spiritual reason. 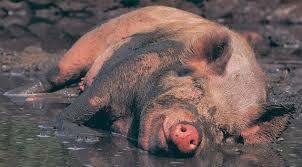 The pig is an animal that prefers to lay around in filth, instead of clean surroundings. They will lay in their own feces and urine all day long. A pig is also a very selfish and gluttonous animal. They will eat and eat and eat. The adult pig will eat their young, when they can’t find anything else to eat. Many people who regularly consume pork, have taken on many of the attributes of pigs. Those pork consuming people, claim that if the pig is raised in a clean environment and fed only clean food; then there is no problem eating pork. That is just like saying if a buzzard (a bird that only eat the flesh of the dead), is fed clean meat; then it is okay to eat them. What they fail to understand is the nature of the pig. 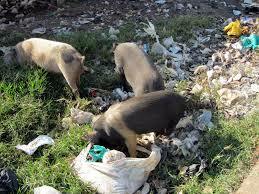 Pigs were created to be scavengers. The only differences between pigs and buzzards are; pigs don’t fly and they don’t wait until an animal or a Human Being is dead, before eating its’ flesh. Pigs will kill to eat; whereas buzzards never kill. Buzzards will wait until the animals die. The meat of the pig is being consumed all over the Earth; except in the countries with large populations of Muslims and Hindus. Many people are becoming aware of the filthy eating habit of the pigs; which includes pigs eating the flesh of dead animals. Dead animals which also includes eating the flesh of dead Human Beings. But many people continue to ignore their common sense and keep on eating swine flesh. Many claim that they love “bacon” too much to stop eating the diseased flesh of the pig. They have been deceived by other so-called intelligent people who tell them it is okay to eat pork. The people of the world don’t seem to understand that we have had Human devils living among us, for thousands of years. These flesh and blood **Devil’s Advocates have been secretly working to turn humanity away from G-D’s Commands. If G-D tells us in the Bible and the Qur’an , not to eat the flesh of the swine; then they will tell humanity, to go ahead and eat it. Whatever G-D has forbidden for Mankind; then they try to make those things look attractive to us. When information was revealed by the scientific community that the meat of the pig had numerous parasites in it. Then these conniving devils explained the report away by saying that you must cook the pork thoroughly; with high cooking heat, to ensure all the parasites are dead before you eat it. What other meat do we eat that has this type of warning? Whatever G-D commands us not to do; then these secretive devils tell Mankind, to go ahead and do it. Their mission from centuries ago has always been, to turn Humanity away from obedience to the Commands of G-D. They have now made (thru the media) immoral acts like fornication, adultery, abortions, and homosexuality as casual and acceptable behavior. Pushing Atheist beliefs is another part of their plot against humanity. But their most successful scheme from the past was deceiving Humanity into ignoring their common sense and to continue eating the meat of this filthy, worm infested, feces eating animal. But many humans who have been deceived, think that they are more intelligent than the Creator; so they choose to continue eating the vile meat of the pig. They continue to ‘dig their graves with their teeth’ by eating this divinely forbidden animal. There are a few verses in the Holy Qur’an, where The Creator has revealed that many thousands of years ago; some Human Beings HE turned into Apes and Swines, because of their disobedience, and rebellion against HIS Commands. So these Humans ‘de-evolved’ into Apes and Pigs. Maybe that is why there is a biological similarity between Humans, Pigs and some Primates. This may be another reason why G-D has told us not to eat pork. *G-D instead of god. When it is spelt backwards it is “dog.” This is not a respectful spelling to be used for The Lord-Creator of the Heavens and Earth. In addition this English spelling of god, for the Creator was a secret joke on the Christians in England by these same devils, who tricked the people in Europe into ignoring their common sense and continue, eating this forbidden meat. They were implying that Christianity was like a dog on a leash. Later they invented the ‘dog collar shirts worn by priest. Thus cementing the message that, Christians were under their control. Like a dog with a master. Another article about this diseased flesh animal. Eat healthy, all you beautiful people. Human Beings have been deceived into eating this filthy, diseased, worm infested animal. Unfortunately, too many people love to eat the meat of the divinely forbidden swine. Eating pork is the hidden cause of so many of our illnesses. cool story bro. enjoy your brainwashed existence. Yeah, because you live in fantasy land. You poor, retarded little person.